Migrant Emotions - Become a more settled migrant - Read The Book: Are people with brown eyes are more intelligent? Are people with brown eyes are more intelligent? My daughter recommended I watch a documentary "How Racist Are You. Jane Elliots Brown Eye/Blue Eye Excercise." The documentary captured me. I was disappointed that so many of the 'blue eyed/white folk' didn't get or worse, didn't allow the exercise to be completed. The exercise was a chance for the blue eyed people to experience what life was like in a brown eyed world. Many of the participants missed an opportunity of learning and empathising. The video is worth watching, even to see how the group dynamics play out. This particular clip was an experiment carried out in England, if you look on youtube you can find versions of the same exercise in other countries. I was so intrigued by Jane Elliot's work that I watched more youtube clips. Oprah had Jane as a guest on her show, 'The Racism Discussion 1992'. The dated clothes, hairstyles, and some attitudes aside, the programme is also recommended watching, Three minutes into the clip a guest asks what proof Jane Elliot has that brown eyed people are more intelligent than blue eyed people. Jane Elliot brings to our attention that brown eyed people, people of colour, brought our civilisation the alphabet, our numerical system, our electricity and every major religion on the earth. Jane Elliot went on to say, "we are educated by a racist school system that only teaches us about white contribution." If you watch any youtube clips of Jane Elliot, you will see that she is not a voice of gentle persuasion. I admire her determination in making us reflect on how racist we can be, even though racism may not be our intention. As Jane said in Part 2 of The Racism Discussion, racism is a learned response and it can be unlearned, but to unlearn such a response will take a conscious effort. Maybe people with brown eyes are more intelligent. The issue is not intelligence, but the treatment of others. I have blue eyes. I have been brought up in a country where whites had more advantages. I am living in a country where whites have more advantages. The Jane Elliot youtube clips I watched made me more aware of how presumptuous I have been. I may have thought I knew how it was for people with brown eyes, but I became aware that I hadn't spent much time thinking how it was for people with brown eyes. I hope I can be open minded and aware of the racism I have. I hope I can keep working on neutralising it. I hope others will too. 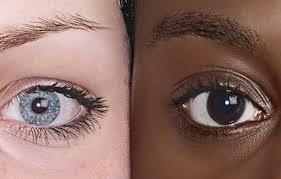 Let me know your reaction to this blog or the brown eye/blue eye exercise?